Not necessarily. Some mushrooms mean you have healthy soil. However, some might mean your lawn is in distress from a fungal disease. After a bout of humid weather or extra rainfall, you might notice mushrooms popping up in your lawn or even your landscape beds. You’ve probably questioned whether the mushrooms are good or bad; most often they cause concern for homeowners. As it turns out, mushrooms in your lawn can be both good, or bad…depending on why there are there and which type. While there are many types of fungi that cause damage to your lawn, or can kill it altogether, there are many other types of mushrooms that indicate your soil is healthy. The beneficial varieties of fungi help to break down organic matter and release nutrients back into the soil. The mushrooms that you see popping up in your lawn are actually the fruiting bodies (kind of like a flower) of the mycorrhizal fungi that is growing beneath the soil. The mushrooms carry and spread the spores that will grow more fungi. Mycorrhizae are a highway of crisscrossing root-like threads of beneficial fungi in the soil that help to breakdown leaves, twigs, grass clippings, animal waste and any other organic matter that is able to compost. If you move around mulch or soil and you see white threadlike forms, that’s the mycorrhizae breaking down the organic matter. When you see mushrooms pop up out of the ground, it’s signal that there is fungi activity going on beneath the soil. Mycorrhizal fungi not only improves soil health, but they also attach to plant roots, aiding them in the uptake of nutrients. In an organically maintained lawn, many mushrooms simply come with the territory. If you find them unsightly, simply kick them over, mow over them or pluck and throw them in the compost pile. 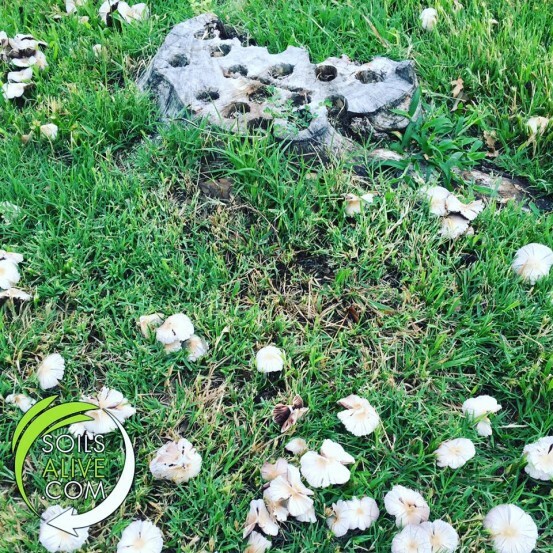 If you notice circular rings of mushrooms coming up in your lawn, it may be fairy rings, which is a fungus that can cause damage to your lawn. Also, if you see clusters of mushrooms popping up around the base of your tree trunk, or shelf-like mushrooms on the tree trunk, that’s not good; it’s most likely a sign of decay within the tree. When you see these kinds of mushrooms, it’s time to call in a lawn and landscape pro or an arborist. A word of caution: It’s best to never eat mushrooms you find in your landscape. While not all mushrooms are poisonous, mushrooms species can be difficult to properly ID without the aid of an expert or seasoned mushroom forager.